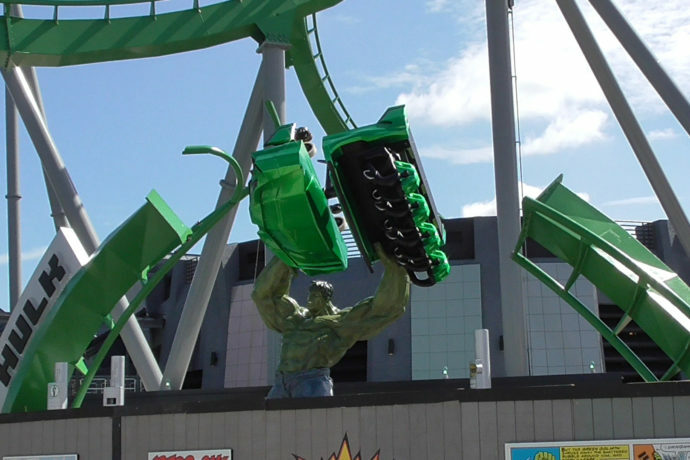 We’re a few steps closer to the grand re-opening of the Incredible Hulk Coaster at Islands of Adventure later this Summer. The brand new entrance and plaza are ready. Most of the work walls are now down throughout the area. A new life-size Hulk statue holding a piece of coaster train between two ripped pieces of track beckons you to enter. And the new locker station is complete, with a new system that utilizes your park ticket to reserve your free locker rather than your fingerprint which can be faulty at times (especially in the hot summer months). Other changes since my last update include some new safety nets, lots of nighttime lighting has been installed on the track supports, the lagoon is filled with water again, and the queue building looks nearly complete on the outside. Trains are now cycling empty for testing, so no more water dummies as far as I could tell. Check out the video as well as lots of images below and stay tuned for more theme park updates! Cannot wait for this bad boy to re-open! Shouldn’t be too much longer now! That’s all for this update. See all the Hulk updates here and subscribe to the feed for more continual updates!